Our chenille fabric has a very soft and plush hand. When made up in a papasan cushion, it looks very soft and inviting. Love Seat Papasan chairs are a comfortable fashion statement. The problem is many times the Love Seat papasan chair frame outlives the cushion. FineWebStores.com to the rescue! 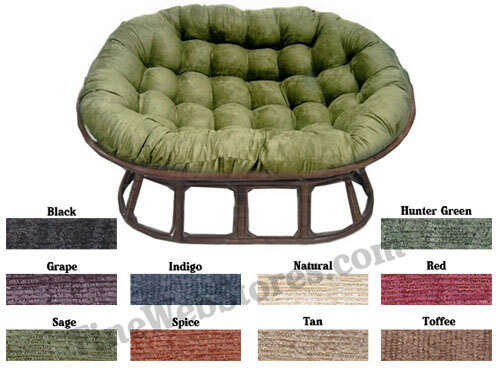 We sell excellent quality replacement Love Seat papasan cushions! Our cushions are approximately 5 inches thick or more and they are filled with soft poly fill.